2016: The 15th Meeting #2016PEP on “Empowerment through Participation” took place in Brussels from 15-16 November 2016. This meeting was held while Europe is in a moment of crisis, with the danger that the European citizens are losing faith in the European project due to the levels of poverty and inequality remain alarmingly high. To emphasize their messages and the need for real participation, the participants organized a collective action. 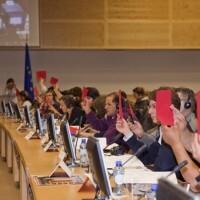 They developed messages for Marianne Thyssen, Commissioner for Employment, Social Affairs, Skills and Labour Mobility. The messages were written on hundreds of paper helicopters, which were launched at the Berlaymont building, and offered to the Commissioner who was present. Read more and access the Videos of the Meeting here. 2015: The 14th Meeting on “Social Convergence in the EU” took place in Brussels from 19 to 20 November 2015. This meeting aimed at creating a space for delegations of people experiencing poverty from 30 countries to bring forward their input on policies to foster social convergence in Europe and thus create the opportunity for them to become makers and shapers of policies that affect their wellbeing. 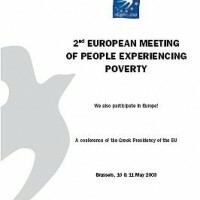 The testimonies of different participants to the meeting emphasized that three things are essential for alleviating poverty in Europe in the current economic and political context: solidarity towards people experiencing poverty, creating spaces for participation of people experiencing poverty to contribute their views and knowledge and working together. Read more and access the Reports and Video of the Meeting here. 2014: The 13th Meeting on “Funding the Fight against Poverty” took place in Brussels from 22 to 24 September 2014. It gathered delegations of people with direct experience of poverty from 31 different national delegations to address and exchange with EU decision-makers. Delegations gave a series of recommendations from the national delegations on how to fund the fight against poverty and invest in the EU Poverty-Reduction Target, topic of the meeting. The meeting also included intense discussions on 5 thematic workshops on Minimum Income for a Decent Life, Homeless not Hopeless, Youth and Poverty, Combating Poverty and exclusion of Migrants, Wealth and Inequalities and the Fight against Poverty. Read more and access the Reports and Videos of the Meeting here. 2013: The 12th Meeting on “What we can learn from the experiences of poverty today” took place on the Esplanade in front of the European Parliament in Brussels from 18 to 20 June. With a less formal format, the event had more elements of solidarity building and cultural exchange. The meeting was seen as an significant event in the calendar of the 2013 European Year of the Citizen. The closing of the event was public and was followed by a symbolic action outside the Esplanade. The 12th Meeting was organised by the European Anti-Poverty Network, with support from the European Commission and in association with the Irish Presidency of the Council of the EU. Read more and access the Reports of the Meeting here. 2012: The 11th European Meeting of people experiencing poverty took place in Brussels on 10 & 11 May 2012 on the topic of “Homelessness and Housing Rights in the Context of the Crisis”. This year’s meeting was focused on three key questions: in relation to homelessness and housing rights what are the key differences that can be seen in 2012 as compared to 2008? ; from the experience of the delegates and the preparation work for the meeting what are the ‘good and bad practices’ in relation to addressing homelessness and housing rights that have been identified? ; How best to design policies to address homelessness and housing that are adapted to the different needs and realities of different individuals and communities and can ensure equality in access to homeless services and housing rights? The meeting brought together over 150 people with direct experience of poverty and homelessness from 30 European countries to exchange views on these questions with EU and national decision-makers. Read more and access the Report of the meeting here. 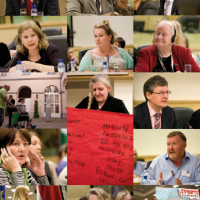 2011: The 10th Meeting of people experiencing poverty took place in Brussels, 14 and 15 May. The reality for people experiencing poverty and social exclusion facing unemployment, work and job difficulties was at the centre of the meeting gathering about 130 delegates representatives of people experiencing poverty and 80 guests coming from EU Institutions in Brussels. Insisting on the urgency to tackle the causes of poverty and not only the symptoms, the delegates expressed their demands to EU Decision makers on several aspects linked to employment, work and jobs: the need for quality jobs, the absence of jobs, the necessary support to access employment and the urgent need to tackle discrimination. EU guests and delegates converged to a common recommendation “The problem is implementation: we need to make it happen!” Sonia Leemkuil, delegate from the Netherlands at the 10th Meeting, reported on the outcomes of the meeting at the First annual Convention in Krakow on 17-18 October 2011. Read more and access the Report, Presentations and Video of the 10th Meeting here. 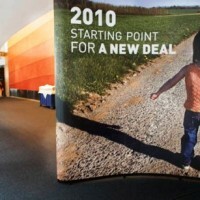 2010: The 9th Meeting of people experiencing poverty took place in Brussels, at the European Parliament on 25 June and at the European Commission the next day, under the Spanish Presidency of the European Union. 15 MEPs and several high-profile officials from the Commission took part in this meeting, entitled “Starting point for a new deal”. The meeting concluded with different priorities calling on the EU to focus on people rather than on competitiveness. These priorities call on EU leaders to reverse the current trend of cutting public services which will not put an end to the crisis but rather worsen the difficulties of not only one fith of the EU population facing poverty but also of several other millions of people at risk of poverty. Read more and access the Report of the 9th Meeting here. 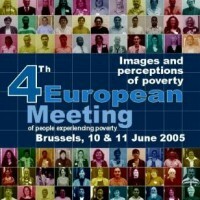 2009: The 8th Meeting of people experiencing poverty took place in Brussels on 15 and 16 May 2009. It was organised by the Czech Presidency of the European Union, with the support of the European Commission and EAPN. The basic purpose of the Meetings of People experiencing poverty is to listen to people experiencing poverty, and to establish a dialogue with policy- and decision-makers in the field of fight against poverty and social exclusion at the European level and at national levels. The 8th Meeting, entitled “Where we live – What we need” addressed the topics of Housing, Financial Inclusion and Access to Basic Services. Read more and access the Report and Video of the 8th Meeting. 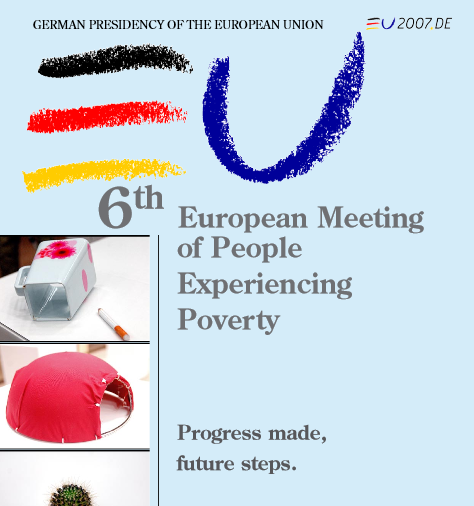 2008: The 7th Meeting, under the auspices of the Slovenian Presidency of the EU, entitled Four Pillars in the Fight against Poverty”, focused on 4 topics: social services, services of general interest, housing and minimum income. These 4 elements were chosen as the 4 major fields in the fight against poverty and social exclusion. it was attended by 124 delegates with experience of poverty from the EU, and about the same number of representatives of national governments, the EC, EU non-governmental organisations and social partners. Read more and access the Report of the 7th Meeting and watch also the film of the 7th Meeting. 2007: The 6th Meeting, under the German Presidency, decided to channel this priority through, and chose as the topic, “Strengthening Progress, drafting next steps”. It saw 130 delegates from 27 countries and 97 representatives of European and national authorities meeting on 4 and 5 May in Brussels. Delegates and guests gave the Meeting topic visual expression through symbolic objects. Without playing down the progress made on the social front, the delegates emphasized that the aim of eradicating poverty by 2010 is unrealistic when there are clear signs that poverty is spreading. The 6th Meeting clearly showed that participatory processes widen the prospects for and help increase workable empowerment. There was also found to be more joint work being done by associations and public authorities, and a demand for ongoing dialogue at national level. Read more and access the Report of the 6th Meeting and Watch the film of the 6th Meeting! 2006: Preparations under the Austrian Presidency encompassed all aspects of poverty and social exclusion around the topic “How do we cope with everyday life?”. The groundwork done by the delegates revealed the pro-activity and energy of people experiencing poverty. Each delegation of people experiencing poverty prepared a poster and presented it to the plenary session: it was an unforgettable highlight of the 5th Meeting. 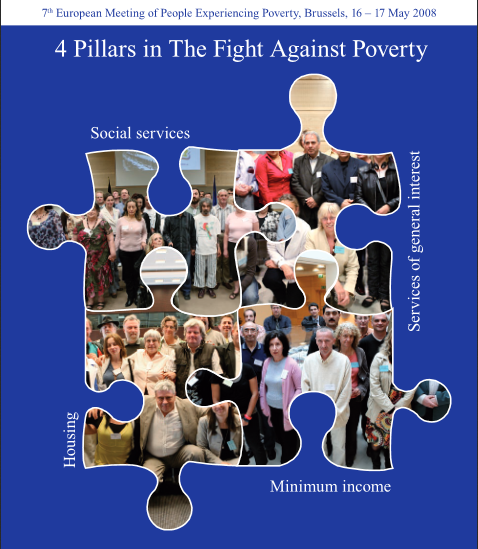 The posters were collected into an exhibition staged at the Finland Round Table, in the Commission building in April 2007, and at the first National Meeting of people experiencing poverty in the United Kingdom in July 2007. The 5th meeting evaluation revealed a need to take stock of the first five Meetings. Read more and access the Report of the 5th Meeting. 2005: The Luxembourg Presidency chose to explore images and perceptions of poverty. A bigger focus is put on media productions – patchworks, paintings and photographs – brought in by people experiencing poverty. These creative endeavours were collected together into an exhibition staged at the Liverpool Round Table. A catalogue of the works was published. The Luxembourg Presidency showed the depth of its involvement by taking a powerful message to the June Council of Ministers, calling on all EU countries to organise the same kind of Meeting. Many EAPN national networks gradually began to set up similar kinds of meetings at national and/or regional level. Read more and access the Report of the 4th Meeting. 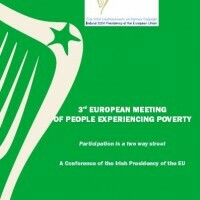 See report of the third European Meeting of people experiencing poverty. 2003: In 2002, the Belgian Government suggested a 2nd Meeting – an initiative taken up by the Greek Presidency. EAPN was asked to prepare it, but time was short to carry out proper groundwork with the delegations. The topic was “good participation practices”. The preparations and workshops produced attempts to create models for participatory processes and a demand from the delegates: people experiencing poverty want to be able to talk face-to-face with policy-makers on policies that affect them. Responding to this demand, the Greek Presidency asked the June Council for the European Meetings to become a recurrent process, like the Social Affairs Round Table. 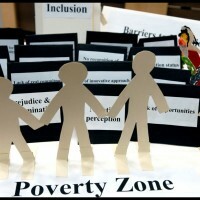 See report of the second European Meeting of people experiencing poverty. 2001: The Belgian Government leveraged its experience in participation since 1994 and capitalised on its Presidency of the European Union to launch the 1st European meeting of people experiencing poverty which reviewed four issues: housing, health, training and incomes. The big conclusion of this first event was that people experiencing poverty had the knowledge and expertise to analyse exclusion, and aimed to take part in society and the decisions that affect their life. 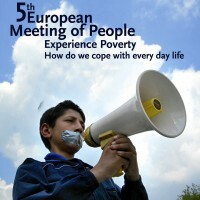 See the report of the first European Meeting of people experiencing poverty.